Between the time of the second and third posting in this series, Iggy suggested a weekly update on Paganism (or Neo-paganism) and I agreed. Seemed easy enough. I participated in-world regularly. So, this would just be a matter of jotting down a few notes. Then the traditional Christian holiday hit with snows, a virus, and a visit from my daughter (which was a redeeming action). And, then, I don't know. Sometimes I just don't log in. January 6th I participated in New Moon Wishing with the Rising Moon group. 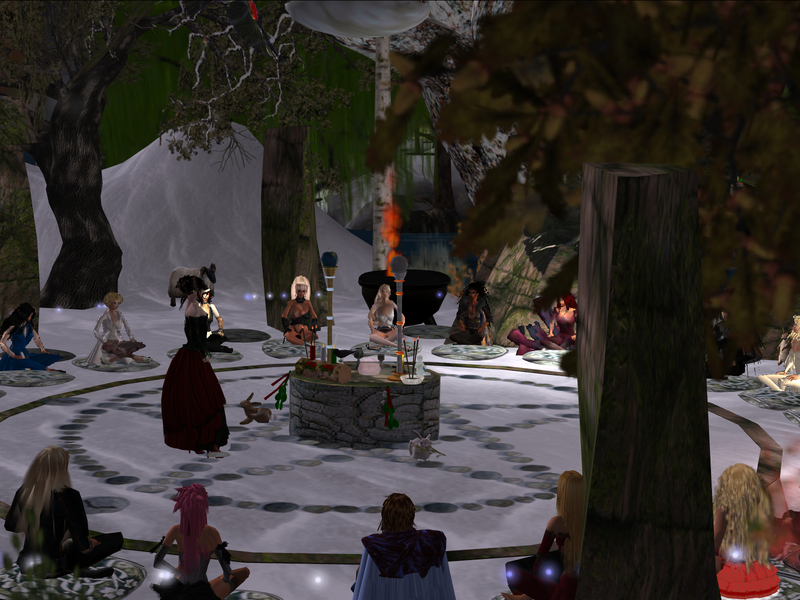 Aoife Lorefield, who led the ritual, talked about the new year and the dominant astrological influences. Aoife is particulary good at welcoming late comers and dealing with technological glitches. The ritual went well. Now that the moon is waning, I'm beginning to see the results of that wishing. Yin wishing is a lot like praying constructed through ritual. I tend to forget most of my wishes, if I'm lucky. One always seems to stand out and haunt me all month. This time is was my healing wish. And I seem to have been favorably answered. 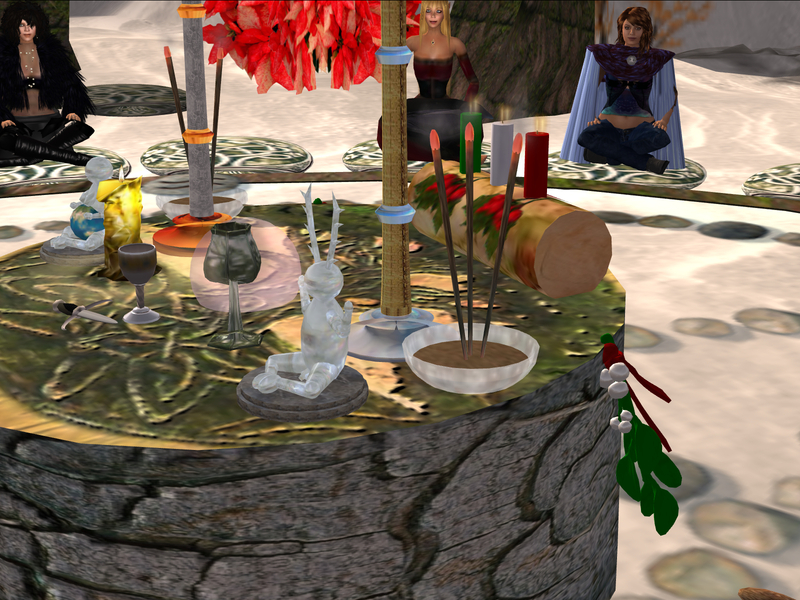 January 5th I participated in a, uh, line energy healing with The United Healers of Second Life. It was tacked on to the end of a discussion, led by Andre Farstrider, about raising energy. About eight avatars lined up and we projected energy to the AV in front of us, imagining our hands on their shoulders. The person at the front of the line got the benefit of all the energy. After a few minutes that person went to the end of the line and so on. When it was my turn, I immediately felt the crush and like I was about to burst. Discovered I was resisting and allowed the flow instead. I didn't stay at the front of the line very long. Unlike me, the pagan groups got right back to it after the holiday, so the schedule is full, starting with Guided Healing Meditation tomorrow at 7 AM (SL) and then Imbolc on Gaia Rising at 11 AM. There's a second Imbolc ritual on Sunday at 6 PM. The Sunday Anam Turas pagan chat on Gaia Rising meets at 10 am. There's lots more happening I'm not reporting here. Hopefully I'll get back into my SL routine soon. 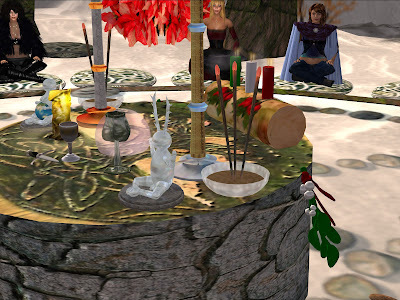 The potential to participate in three Imbolc rituals tomorrow (one in-world, two off-world) should help. I wore my formal robes to enforce my commitment. The sun set during the ritual. The atmosphere effects were quite lovely.